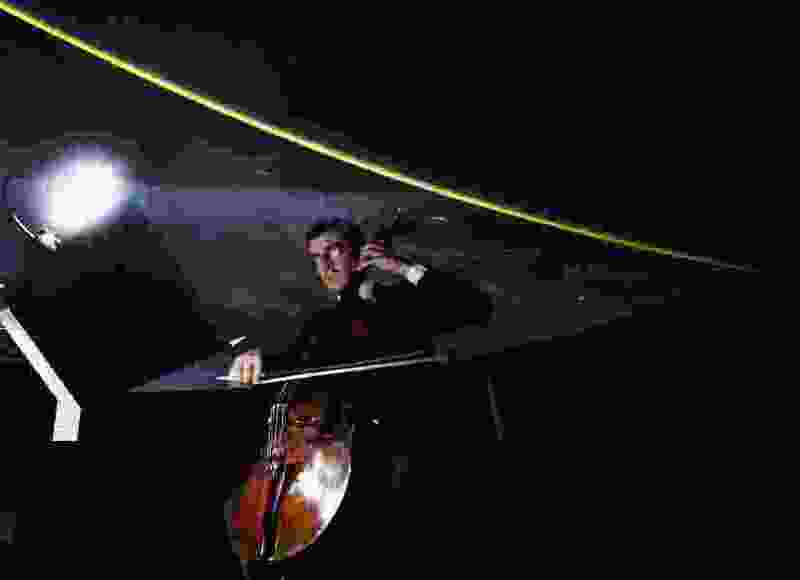 (Leah Hogsten | The Salt Lake Tribune) Utah Symphony principal cellist Rainer Eudeikis, who also performs with the Fremont String Quartet, plays in the Hansen Dome Theatre of the Clark Planetarium, Feb. 5, 2019, during a sneak preview of the Utah Symphony's 2019-20 season. It’s not performed often, Fischer said, because it’s not considered by many classical music lovers to be contemporary (Messiaen died in 1992). Also, it’s long; its 12 movements, played in one sitting, clock in at over 90 minutes. To solve that problem, Fischer and the symphony got permission from Messiaen’s estate to break up the piece into its 12 movements. Four of the season’s Masterworks Series concerts will include a movement, and four more will feature two movements each. The music will be accompanied by images of the Utah natural wonders, such as Bryce Canyon and Zion National Park, that inspired Messiaen. The Messiaen work “was the starting point for our focus on Utah, and also our focus on the natural world,” said Paul Meecham, president and CEO of Utah Symphony | Utah Opera. Other works planned for the season — such as Gustav Holst’s “The Planets,” Ludwig van Beethoven’s “Pastoral” symphony, and Richard Strauss’ “An Alpine Symphony” — suggest natural beauty, complementing the Utah landscapes, Meecham said. The new season also is showcasing works by composers from Central and South America, with two programs led by a guest conductor, Mexico’s Carlos Miguel Prieto. One show, “¡Celebración Sinfónica!” on Sept. 16, will include works by Mexican composers José Pablo Moncayo and Carlos Chávez. And Prieto will conduct again on Nov. 8 and 9, in a program that places “Sensemayá,” an orchestral piece by Mexico’s Silvestre Revueltas, alongside the more familiar Rachmaninoff third piano concerto. “There are great composers from [the Americas]. They just haven’t had the champions,” Meecham said. The symphony has been working to reach out to Utah’s Latino population, and adding Hispanic composers and conductors is “a very big effort,” said David Utrilla, CEO of Salt Lake City-based US Translation Company, and a member of USUO’s board of trustees. Utrilla also points to the season’s first music-and-film event, a screening of the Disney/Pixar hit “Coco” with live musical accompaniment, set for Nov. 1 and 2 — to coincide with Dia de Muertos, the Day of the Dead, the Mexican holiday celebrated in the film. Two other celebrations are prominent in the symphony’s 2019-20 season. The year 2020 marks the 250th birthday of Ludwig van Beethoven, and the symphony will perform four of his nine symphonies between February and May. The other big birthday — to be celebrated on May 16, 2020 — is for the Utah Symphony itself, marking 80 years since its founding. For the celebration concert, the symphony is bringing in one of the biggest names in classical music: violinist Joshua Bell. All concerts listed take place at Abravanel Hall, 123 W. South Temple, Salt Lake City. Current season subscribers have until March 28 to renew or request seat changes for the 2019-20 season before they are released to new subscribers and subscribers requesting seat changes. Sept. 16, 2019 • “¡Celebración Sinfónica!” (Special Event) • Carlos Miguel Prieto, conductor • Program includes: Moncayo: “Huapango”; Chávez “Sinfonía india”; and more. Sept. 20-21, 2019 • “The Music of John Williams” (Entertainment Series) • Jack Everly, conductor • Program of John Williams film scores; details to be announced. Sept. 24, 2019 • 60th Anniversary Salute to Youth (Special Event) • Conner Gray Covington, conductor; winning soloists from the Salute to Youth Competition • Performances by Utah’s most up-and-coming musicians. Oct. 25-26, 2019 • Rachmaninoff’s Rhapsody on a Theme of Paganini (Masterworks Series) • Aziz Shokhakimov, conductor; Lukáš Vondráček, piano. • Program: Mussorgksy/Rimsky-Korsakov: “Night on Bald Mountain”; Rachmaninoff: Rhapsody on a Theme of Paganini; Prokofiev: Symphony No. 5. Nov. 1-2, 2019 • “Coco” Film in Concert (Special Event) • Conner Gray Covington, conductor • Program: Michael Giacchino: Score of “Coco,” in live accompaniment to the film. Nov. 16, 2019 • Gershwin Unwound (Unwound Series) • Thierry Fischer, conductor; Kevin Cole, piano • Gershwin: “Rhapsody in Blue”; and more. Nov. 30-Dec. 1, 2019 • “Messiah” Sing-In (Special Event) • Conner Gray Covington, conductor • Program: Handel: “Messiah,” with the audience providing the vocals. Dec. 6-7, 2019 • A Broadway Christmas with Ashley Brown (Entertainment Series) • Michael Krajewski, conductor; Ashley Brown, vocalist; Choristers from The Madeleine Choir School • Program of holiday and Broadway favorites; details to be announced. Dec. 7, 2019 • “Here Comes Santa Claus!” (Family Series) • Conner Gray Covington, conductor • Holiday favorites for all ages, and a visit from a certain red-suited jolly man. Feb. 7-8, 2020 • Fischer Conducts Gershwin & Dvořák (Masterworks Series) • Thierry Fischer, conductor; Joyce Yang, piano • Program: Bernstein: Three Dance Episodes from “On the Town”; Gershwin: Piano Concerto in F; Dvořák: Symphony No. 8. Feb. 14-15, 2020 • “Women Rock!” (Entertainment Series) • Sarah Hicks, conductor; Cassidy Catanzaro, vocalist; Katrina Rose, vocalist; Shayna Steele, vocalist • Program of songs by women rock stars (Carole King, Holly Knight, Tina Turner, Janis Joplin, Aretha Franklin, Pat Benatar, Minnie Riperton, Heart, and more), details to be announced. Feb. 21-22, 2020 • Beethoven 2020: Symphony No. 7 (Masterworks Series) • Thierry Fischer, conductor; Francesco Piemontesi, piano • Program: Messiaen: “Bryce Canyon and the Red-Orange Rocks” from “Des canyons aux étoiles”; R. Schumann: Piano Concerto; Messiaen: “Cedar Breaks and the Gift of Awe” from “Des canyons aux étoiles”; Beethoven: Symphony No. 7. Feb. 28-29, 2020 • “Singin’ in the Rain” Film in Concert (Entertainment Series) • Conner Gray Covington, conductor • Program: Nacio Herb Brown: Score of “Singin’ in the Rain,” in live accompaniment to the film. March 28, 2020 • “Carmina Burana” Unwound (Unwound Series) • Kazuki Yamada, conductor; Madeline Adkins, violin; Amy Owens, soprano; Brian Stucki, tenor; Christopher Clayton, baritone; Barlow Bradford, chorus director; Utah Symphony Chorus; Choristers of The Madeleine Choir School • Program includes: Orff: “Carmina Burana,” and more. April 10-11, 2020 • Brahms’ Piano Concerto No. 2 (Masterworks Series) • Thierry Fischer, conductor; Nicholas Angelich, piano • Program: Wagner: Prelude to Act III from “Lohengrin”; Mahler: “Totenfeier, A Symphonic Poem”; Messiaen: “Interstellar Call” from “Des canyons aux étoiles”; Brahms: Piano Concerto No. 2. April 17-18, 2020 • The Temptations with the Utah Symphony (Entertainment Series) • Conner Gray Covington, conductor; The Temptations, guest artist • Program: An evening with the Motown legends, with such songs as “I Can’t Help Myself,” “Ain’t Too Proud to Beg,” “Reach Out (I’ll Be There),” “My Girl” and more. May 1-2, 2020 • Beethoven 2020: Symphony No. 5 (Masterworks Series) • Thierry Fischer, conductor; Augustin Hadelich, violin • Program: Messiaen: “The Wood Thrush” from “Des canyons aux étoiles”; Beethoven: Romance No. 1 for Violin; Messiaen: “Omao, Leiothrix, Elepaio, Shama” from “Des canyons aux étoiles”; Duttilleux: “The Tree of Dreams”; Beethoven: Symphony No. 5. May 16, 2020 • 80th Anniversary Gala with Joshua Bell (Special Event) • Conner Gray Covington, conductor; Joshua Bell, violin • Program: Smetana: “Moldau” from “Ma Vlast”; Strauss Jr.: “Emperor” Waltzes; Beethoven: Violin Concerto. May 22-23, 2020 • Beethoven 2020: “Eroica” (Masterworks Series) • Thierry Fischer, conductor • Program: Messiaen: “The Resurrected and the Song of the Star Aldebaran” from “Des canyons aux étoiles”; Beethoven: Symphony No. 3 “Eroica”; Messiaen: “Zion Park and the Celestial City” from “Des canyons aux étoiles”; Ravel: “Daphnis et Chloé,” Suite No. 2.